Are you looking for a great gift for the horse lover in your life? Horse jewelry is the answer! Brooches featuring horse motifs make a great gift for Mom, Grandma, a coach or trainer, or anyone who appreciates fine horse jewelry! Bridle rosettes (sometimes called halter rosettes) are glass domes with pictures. They came in pairs, and were used, as you might expect, to decorate a horse’s bridle or halter. Today, lovers of vintage and estate horse jewelry enjoy these rosettes as brooches. They’re substantial pieces that look great on the lapel of a blazer or coat. Truly lovely, these rosettes featured all kinds of images. Horses were an especially popular subject, and we’re lucky enough to have several examples in our collection. This bridle rosette brooch features a liver chestnut horse with a bridle . It’s just about 1 3/4″ in diameter, and has a very substantial pin back. You can wear this pin confidently, knowing that the clasp is secure. Here’s another great bridle rosette brooch. It has a vibrant dark red background – perfect for the holiday season! 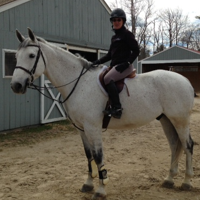 – and a spirited chestnut horse. 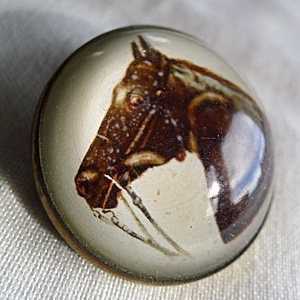 This is a great piece of jewelry for the collector who has just started exploring vintage horse jewelry. This brooch looks fabulous on a dark blue or navy background. And here’s what may be our favorite bridle rosette brooch in the collection right now. Against a beautiful blue background is a chestnut horse with a blaze. He looks happy and alert, ready for adventure – full of an exciting, dynamic energy that is a joy to wear! 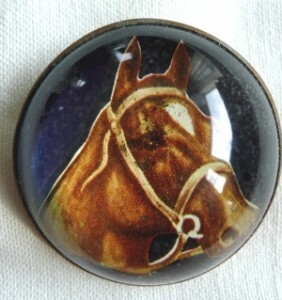 Horse brooches are a great gift item. The nice thing about bridle rosette brooches is that they’re really reasonably priced. 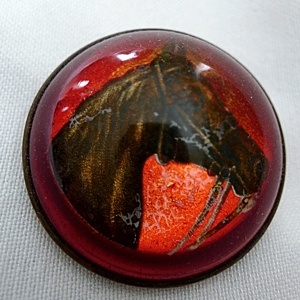 Many in the EquestrianJewelry.com collection are under $100. So if you’re stumped searching for a great gift item for the horse jewelry lover on your list, consider bridle rosette brooches!